I read Marco after I finished reading All for One in the Sky Ghosts series (thanks to the author). And I had no choice but to finish it in one sitting. The book kept me hooked on till the end. Though titled as Marco, this book focuses on Pain and Marco (Better explained as if it is not Marco's personal views, then its Pain's thought about Marco!!!) Right from their introduction till the end of the book, Alexandra takes you on a journey into the lives of these two characters. At one point, this book makes you feel that you are right there inside the book, like an onlooker, watching the antics of Pain and Marco. You will laugh with them, at them, you will cheer them when they fight. Alexandra has this ability to get her readers involved. What appears to be hate at first sight, is later the very foundation of a strong friendship. They are the perfect example for the scientific theory, unlike poles attract. Now to think about, isn't it stragely true that the best of friends are actually those who begin on a wrong note??? I wish I could bring out in detail what I loved about it (which is everything!!! ), but if I do so, I will be named a spoil sport. One needs to read this book in order to embark on a journey into the life of these Sky Ghosts. By the way, many of these Sky Ghosts are teenagers, and the way they fight the Beasts, many an adult would shudder. Doesnt it sound ironical when we label teenagers as wanderers without real purpose??? To sum up, the essence of this book is best understood if you have read All for One (though it is an excellent story even when read in isolation!!!) 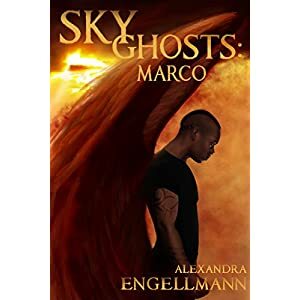 So allow Marco to enter your lives and help you explore the world of Sky Ghosts. P.S- If you thought All For One is good, then Marco is even better.